Kim’s turn to pick the recipe for Food Network Friday this time out. Kim’s got a great sense of fun around food so it didn’t come as a surprise when she picked this off the wall recipe which included pretzels and mango sauce amongst other things. I looked at it then forgot about it and didn’t realise the time had come around so quickly, and I still hadn’t decided how to make it. Seitan was the obvious choice but I seem to be always just replacing meat with seitan recently, so I opted instead for tofu. I followed the recipe pretty faithfully otherwise. I used soy milk with some 3-years-out-of-date egg replacer (cornflour or chickpea flour would work just as well), and better than beef stock in the gravy. I found a spicy mango chutney in the shop so bought that one for an extra kick. I served this alongside some garlic and ginger cauliflower which was a tester a while ago for Carla and loved; English cauliflower is really good at the moment. I also made some plain basmati rice and mixed some chopped coriander through it. Although at first this seemed really wacky, it’s only using pretzels instead of breadcrumbs and adding some seetness to a gravy. I really wish I’d have marinated the tofu first because although the coating was tasty the tofu inside was bland. I had the thicken the sauce up a bit but my worries that it would be too sweet were unfounded. This was once again a dish I’d never have looked twice at without FNF but another one we enjoyed a lot. And nothing better than leftover pretzels that need eating – am I right? 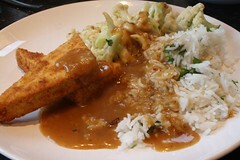 Don’t forget to go to Vegan Appetite and see what everyone else made of this intriguing dish. And keep an eye out on Tami’s Cookalong tab to see what’s coming next and join in! You’d be very welcome! This entry was posted in Food Network Friday, Uncategorized by efcliz. Bookmark the permalink. Liz, yours and mine could be twins! Wait until you see the photo.